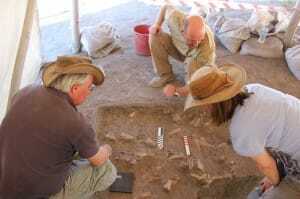 Excavation and analysis of the finds at the dighouse and in laboratories in Turkey and elsewhere are providing us with a rich and detailed record of life at Boncuklu. The people of Boncuklu lived in oval shaped buildings, usually dug down into the ground, with mud brick walls. 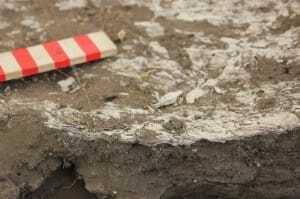 So far the remains of 22 buildings have been excavated. Because the mound is built up of successive mud brick buildings, each one being constructed on the demolished remains of the previous ones, we often find only the floor surfaces of buildings with very little in the way of upstanding walls. One of our buildings is very well preserved (right) and has the remains of low mudbrick walls surviving around the sunken area. It also had a ground floor entrance or doorway. The space inside the building had a plaster floor divided into an upper clean area and a lower dirty area near the fireplace which contained many stakeholes, perhaps the remains of wooden frames used in cooking or other household activities. The clean area was sometimes painted with red ochre and often included a raised plaster platform. In one building we also have the remains of two cattle skulls which were attached to the wall and covered in plaster. Boncuklu’s houses are quite different to those built 1000 years later at Çatalhöyük and other sites which are larger, rectangular in plan and have an entrance located in the roof of the building with a ladder enabling access to the interior. Some things are similar to Çatalhöyük, including the presence of plaster platforms on the floors, the repeated division of space and the presence of plastered bulls heads (known as bucrania) on the walls. Unlike modern people in Turkey, Boncuklu’s dead were buried beneath the floors of the houses in pits which were then covered over and replastered. Following the burials people continued to live in the houses above their ancestors. Most buildings contain 2 or more burials and sometimes the same grave was used for more than one burial. Bodies were typically buried in a crouched position, sometimes buried with simple grave goods such as stone tools or pieces of red ochre. Some of the burials present an intriguing snapshot of life 10,000 years ago and it is tempting to imaging how or why the burials came to be. Grave 17 (building 13) contained woman and a new born baby (right) – perhaps they died during childbirth or shortly afterwards. In Building 4 Grave 16 contained a mature man who was buried with a toolkit of obsidian blades and an obsidian core as well as a large lump of ochre next to his head. A woman was buried on top of him, facing downwards. The man, who also had injuries that may have been sustained during hunting or fighting, seems to be an important person because of the grave goods buried alongside him. But why he was buried with a female on top of him is a mystery, we don’t usually find that sort of double burial. It seems likely that this unusual juxtaposition of an adult male and female in a single grave ostentatiously symbolised the close association of these individuals during their lifetime. We have found many man-made objects that help us to understand how people lived in the past at Boncuklu. They include bone points, studies under the microscope show that the bone points were used in basket making, and ground stone tools. Cutting tools, used for crafts, hunting and food preparation, were mostly made up of tiny blade segments called microliths (upper right). These are only a few mm in length and were attached to wooden shafts and handles to make composite cutting tools. 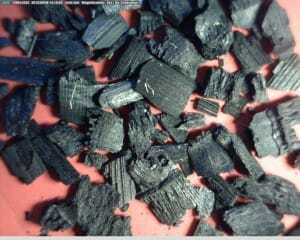 Most blades were made from obsidian, volcanic glass, which was imported 190km from Cappadocia. Small blades are also occasionally found as are the cores from which the microliths and blades were detached with a hammer. 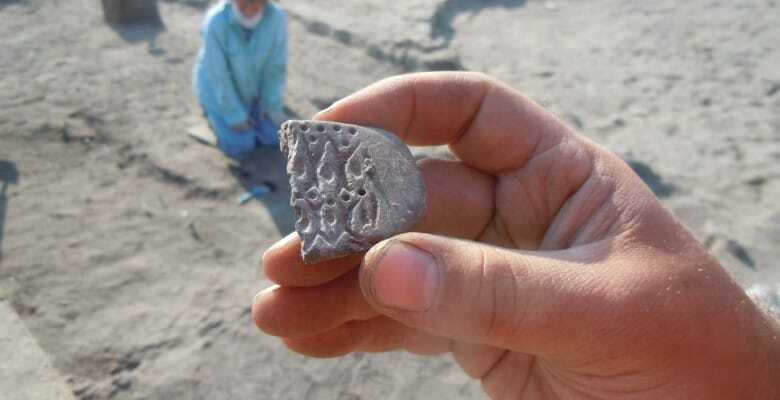 As well as the stone, sea shell and bone beads after which the site is named (Boncuklu = beady place), the stone and shell coming from distant places, there are numerous small clay tokens. 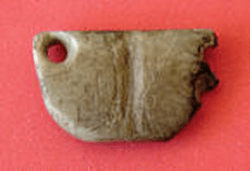 The clay tokens may have been early counting devices, lots, or gaming pieces. There are also decorated stone plaques and grooved stones (lower right), these last possibly shaft straighteners for straightening arrow shafts. The elaborate decoration of these items consists of both geometric and naturalist designs. The latter include a tree and a fish. The Boncuklu logo is one of these plaques. These elaborately decorated items seem closely associated with the marking of individual and group identity. We recover a wide range of plant remains from the excavation and they can tell us a lot about the how people lived and their environment. As well as actual plant remains, we have discovered the impression of reeds on the floors of the houses. Throughout Boncuklu the microscopic remains of the plants people used for food, fuel and in building their houses can be found. These include the burnt remains of wood, seeds and stems from the fires people burned in the past for heat which we collect by sieving all of the soil from the site using a special process called flotation. Soil is mixed with water and the burnt plant remains float to the surface and are collected in a sieve. Also present are the microscopic remains of cells from the leaves and stems of many plants, such as wheat and reeds, preserved when silica is naturally deposited in their cell walls. Among the plant remains, reeds are very common, including siliceous (upper right) and burnt remains of their stems (middle, right). 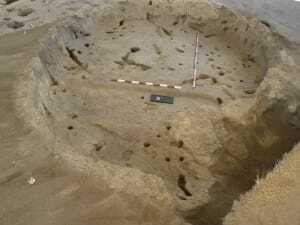 They were used widely at the site for matting, probably roofing and also as fuel in a landscape that had little wood. Fruits of the hackberry, almond and terebinth were collected and eaten as were the tubers of the wetland plant clubrush, which commonly grows in the wetter areas of the Konya Plain today. 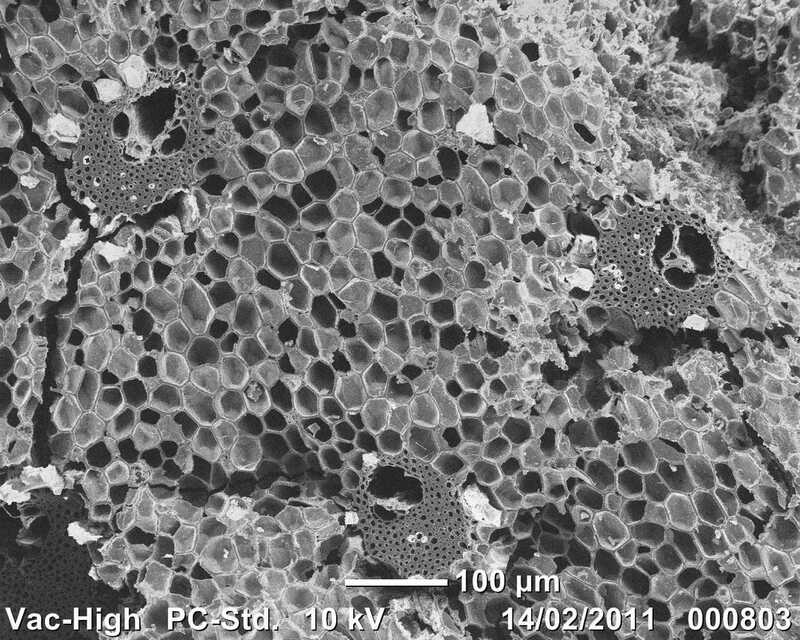 A high powered scanning electron microscope is used to show the cellular structure of the remains of tubers (lower, right) and wood. Among the wood used as fuel was willows, which with the reeds and seeds of many wetland plants show that Boncuklu was located in a wetland, not the dryland we see today. Crop remains are rare but include primitive glume wheats which are today only grown in remote parts of Turkey and have been replaced everywhere with more modern forms of wheat. Many different types of animal bones are found in the soil excavated from the mound and are recovered by careful sieving of the soil. Most of the bones we find have been broken down into small fragments so that the bone marrow can be removed. 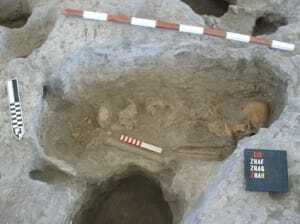 We find aurochs (large wild cattle), pig, goat, tortoise, bird, frog and fish bones. We also find tortoise shell fragments as well as snail shells and egg shells. Waterfowl were very common. People at Boncuklu ate everything that walked, flew or swam and the presence of so many wetland birds and fish suggests that a wetland habitat and/or lake were present nearby. Occasionally we find special deposits of bones which have not been broken down into small fragments and in some cases appear to be buried in pits within a reed mat or bag (above).These may be the remains of feasts or special meals and perhaps were buried to signify a special event.